Poached fish recipes can be simple or complex. 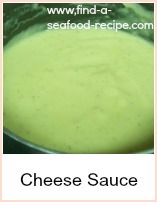 The poaching of the fish is not hard, but sometimes the sauce making is complicated. It's not impossible to get right and I'll give you tips where I can. The poaching liquid can be water, court bouillon, fish stock, milk, wine or a mixture and the fish can be fillets, rolls, steaks or whole. A whole poached salmon makes the most wonderful centrepiece at a buffet and sole veronique is a marvelous main course for a sophisticated dinner party. Poaching a whole fish is simplicity itself - wrap the fish in buttered foil, put it into cold water, bring it up to simmering, turn the heat off ,put a lid on the pan and leave it to cool. Don't put the fish into boiling poaching liquid - the skin will shrink and break the fish up. 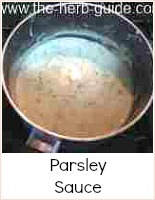 Don't let the poaching liquid boil - just break into a simmer - a rolling boil will break the fish. If you have a very large whole fish then you can either use a fish kettle or cut it into pieces to fit your available pans - just rejoin when serving and cover the joins with garnish - cucumber, mayonnaise etc. 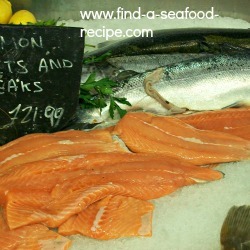 A simple method of poaching salmon that works every time on any size piece of fish - from a steak to a whole salmon. 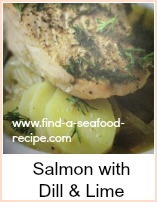 Simple instructions on how to poach fish with salmon recipes.